Lamb loin is one of the most delicious and treasured cuts of lamb. Cooked to medium rare, or to a pink color, it can be so tender and absolutely delicious. Yet many people think they do not like lamb. If you want great lamb, it is important that the meat come from a breed used for eating, rather than wool. Sheep with wool often have a very strong and gamy flavor to their meat. The lamb should be grassfed, as lamb tastes very much like what the animal was fed. The roast must also be cut properly, with the natural bone and fat. The rack of lamb split loin roast sold by U.S. Wellness Meats fits all these requirements perfectly. It comes from Katahdin sheep, a meat breed which is not used for wool. It is grassfed only. And it is cut perfectly for roasting. The meat is in one piece, surrounded by the natural bone and a thin layer of the natural fat. Unlike supermarket lamb loins, the bones are not cut through. 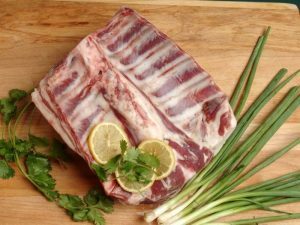 While cutting through the bones makes it easy to cut the meat into chops after roasting, it results in the loss of natural juices and flavor The uncut bones provide incredible flavor and juiciness to the meat, which is flavored by the bones and the fat. This also makes the meat more tender. The bones and fat are the two best spices you could have for this meat. The bones also make a perfect roasting rack. In this recipe, I have added some English herbs that enhance the already wonderful flavor. There was a famous song that contained the words “Parsley, Sage, Rosemary, and Thyme…” Few people realize that these herbs form a traditional English flavor combination, one that is fantastic with lamb. About an hour before you plan to cook the roast, combine all the other ingredients in a small bowl and mix well. Place the roast on a plate, and rub the mixture all over the meat, fat, and bones. Let rest at room temperature for about an hour. Place the lamb bone side down in small roasting pan. Place the pan in the oven, and roast for 25 to 30 minutes, until done to your taste. 25 minutes should give you a medium rare roast. Using a sharp, sturdy knife, cut between the meat and the bones, which will give you a cylinder of delicious boneless meat. Cut the meat into serving pieces. Enjoy the wonderful flavor! Stanley Fishman is a cookbook author and blogger who is an expert on cooking grassfed meat. 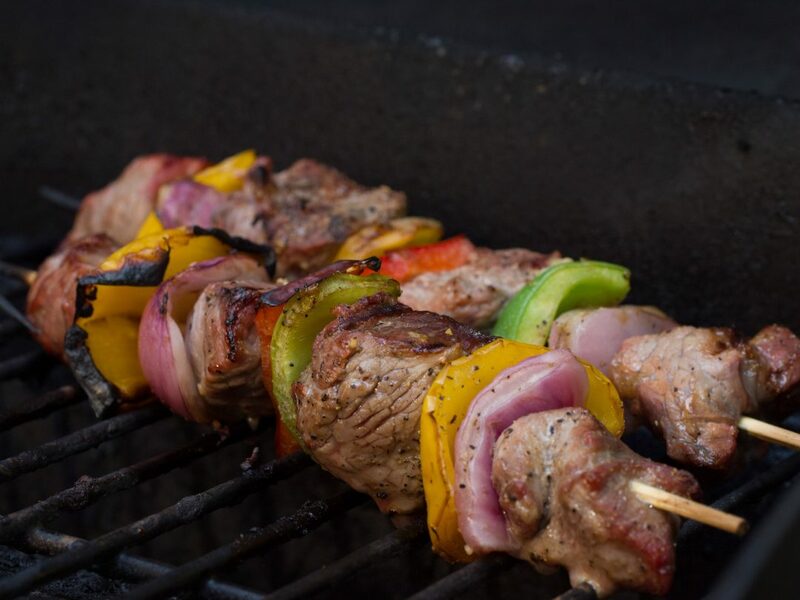 Stanley uses traditional flavor combinations and cooking methods to make the cooking of grassfed meat easy, delicious, and tender. Stanley has written two cookbooks that make it easy to cook grassfed meat —Tender Grassfed Meat: Traditional Ways to Cook Healthy Meat and Tender Grassfed Barbecue: Traditional, Primal and Paleo. Stanley blogs about real food and the cooking of grass-fed meat at his blog Tendergrassfedmeat.com.